Access Displays began in 1990 when established by its founder and C.E.O. Peter Bowen. Peter’s goal was to help businesses and individuals get the most out of exhibiting. The exhibition industry was growing rapidly. Access Displays needed to grow too. Peter built a team of passionate individuals to support his endeavour. With clients attending more events, our partnerships with them expanded. Our mission is to help our clients maximise their return on investment. Exhibiting is not cheap, but there are solutions out there to fit the budget, whether it is big or small! Our head office is just off junction 16 of the M4, therefore a central location for accessing the venues all around us. We also have representatives and partners who cover not only the UK, but on a global scale. Some of our clients have been with us for over 25 years! Did you know Access Displays formed the same year as the world wide web? That’s 8 years longer than Google! This is one of the most exciting things about us! We’re a rather unique company working with many different clients, industries and solutions. 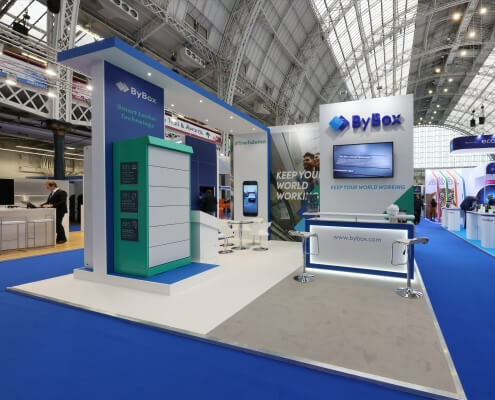 Working with exhibitors on their UK or global exhibitions with exhibition stand design and build. Full project management service including submission of plans. Offering a hire service and graphics production for events. Including display boards, shell scheme hire, glass display cases, furniture, plinths and AV. Offering over 5000 products to buy online. Including display cabinets, notice boards, literature stands, exhibition and display lighting and even more! Facilitating projects with museums, shopping centres, schools and offices. Projects include custom display cases, shopping centre displays and custom notice boards. Our team are some of the most experienced individuals in the industry. With specialists in areas from design and graphics production through to project management. We can support your business with turn-key solutions and a dedicated point of contact. We offer excellent support, which is why some of our clients have been with working with us for over 25 years! Jason was absolutely fantastic yesterday … so glad we chose Access to handle this all for us, it’s taken away so much stress!! Just a very quick note to thank all at Access Displays for all your help and hard work on our stand at MACH 2018. I have exhibited at shows for over 20 years and been stand manager for the last 12 and this show was the least stress free, particularly during build. Your stand builders were very professional and hard working with great communication from all the guys. The finished stand was superb, with lots of compliments during the show from customers (and rival companies!). As this was our first show with you, the final show stand was even more pleasing. Again if you could thank everyone involved from myself and Sunnen Products Ltd it would be very much appreciated. Thank you very much for all your team’s efforts with our MACH Show exhibition stand. The show’s been a great success and we’ve been thrilled with your attention to detail to ensure we’re entirely happy with stand. I just wanted to say I have been doing this job for many years but not one stand builder has ever been so accommodating or as professional as your team but I want to single out Emma Thatcher as she has been simply outstanding as a project manager a true asset to your company. Thank you @AccessDisplays the stand looks amazing. We are all ready for the visitors. I just wanted to say a big thank you to everyone at Access Displays; Rebecca was great coordinating everything and the stand looked fantastic. We were 100% happy with the stand and the staff who erected and dismantled the stand both of whom were excellent, we have booked a slightly bigger space for W18 if you would like to pencil us in.